Today we put the winter cover on the boat. I neglected to get a photo of the giant green tarp with little tidbits of trailer noticeable under the bottom edge, but you can see the frame in the photos above. 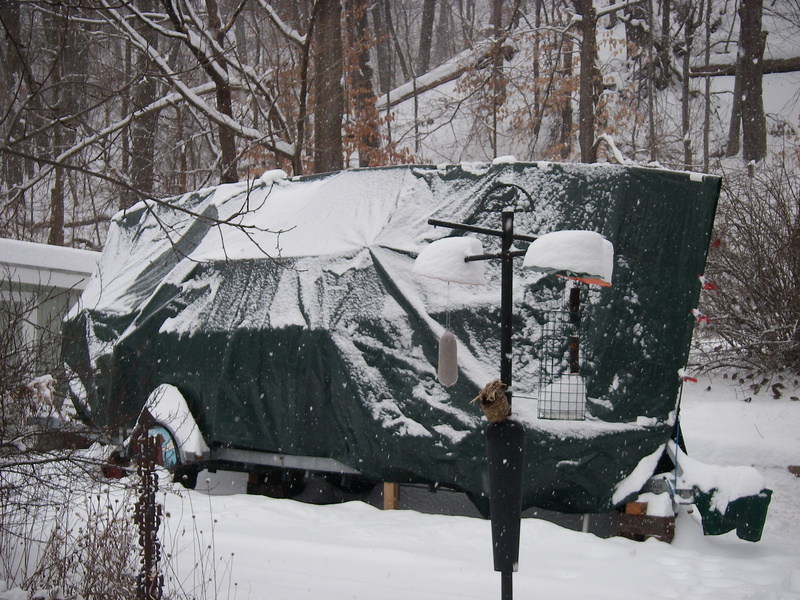 Now with the tarp on, when we start getting snow it will fall right off, and it’s all very satisfying. 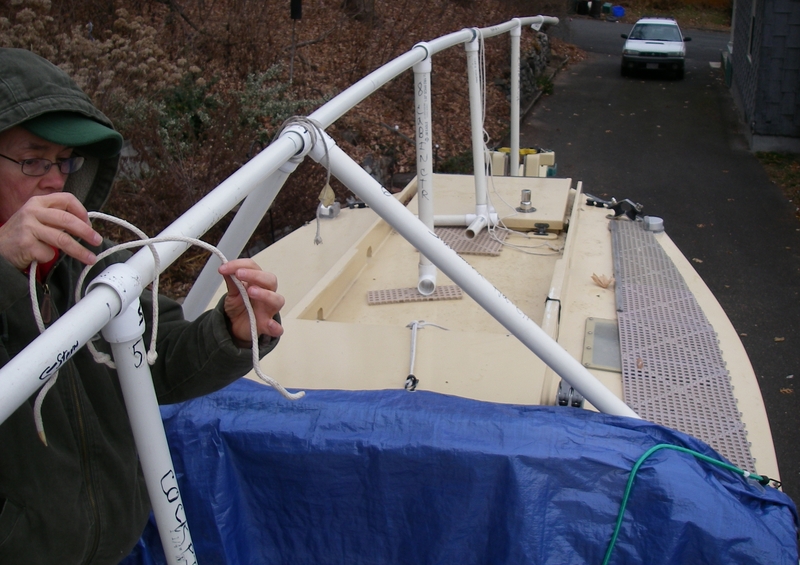 In the previous two weeks, the boat and trailer went up on the winter blocks. This keeps the tires off the ground, and makes it possible to turn them now and then so the brakes don’t lock up with rust. Normally the boat is not so high off the ground, jacked up just enough to take the weight off the tires. But this year one of the big projects is rudder repair, so the cribs that support the trailer are built higher, and last week we let the rudder down and completely off the boat. 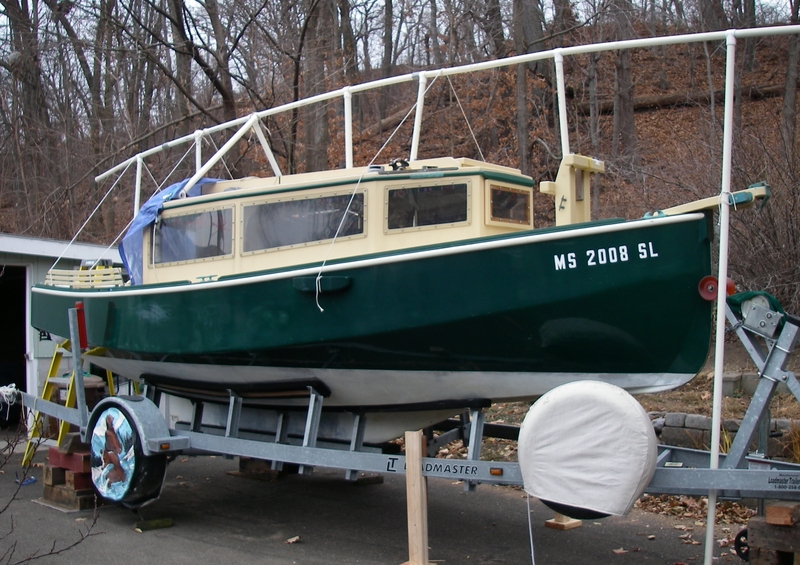 Originally I had the silly idea that the rudder repair would be quick, the rudder would be reinstalled, and we would put the boat back down in its normal lower winter position. Alas, as these things often go, more is going to be involved to put the steering right. With the prospect of the boat staying up high for the winter, catching wind on the giant tarp, we added those extra supports made out of two by fours that you can see nearer the front of the trailer. Now the boat is much more solid all the way around, so we should be good even in the winter storms, while still being able to fuss with the rudder. Anyway, for now the boat is snug. I miss getting to see its details out the window, but am delighted at the thought of watching all the snow slide to the ground, all by itself. We have lately been having some really cold weather – one night with single digits, and incredibly cold wind – so I’ve been particularly happy to be home!